This post contains a compensated review of a product I was given for free for the purpose of the review. 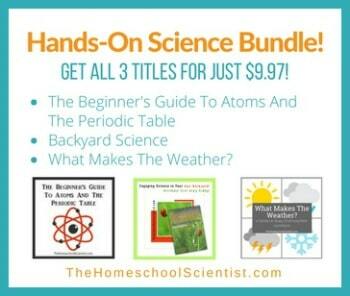 As with all product reviews on The Homeschool Scientist, the opinions are all mine! One of the most important life skills I want my children to learn is time management. It is a skill that can make or break a student, a professional, and a parent. Without good time management skills, assignments don’t get completed, life gets rushed, people get stressed, and goals don’t get accomplished. It is never too early to teach time management skills. From the time my kids were small, we had daily chore charts and homeschool assignment lists for them to check off. They knew that these things had to be done by a certain time each day or before play time. This helped teach age appropriate daily time management. Now that they are getting older, 9 and 13 years old, they need to see how those daily time management skills relate to achieving their goals and the big picture. A good homeschool student planner is a great tool for this. I’ve been looking around at various homeschool planners and trying to choose one for my kids to use during the next school year. The planner needs to have a place to record daily assignments, plus a way to keep the big picture in front of the kids. Our friends at A Plan In Place let me have a copy of their Customizable Student Homeschool Planner to review and see if it would be a good fit for our family. At first glace, I was excited about this student planner. It was divided into three sections: Goals & Planning, Weekly Schedule, and Notes & Record Keeping. I could see this was more than just a daily planner. It was created to keep track of daily tasks, but with long term vision in mind. Just what I was looking for. As I browsed through the Customizable Student Homeschool Planner , I could see that a lot of thought went into it’s creation. When students use this planner, they are doing more than writing to-do lists, they are actively goal planning and thinking about the future by taking small steps each day. You can tell this by the many features this student planner contains. Because of the extensiveness of this planner, I initially considered it for just for my 13 year old. I thought it might be too confusing for my 9 year old. Now that I have looked over and studied the Customizable Student Homeschool Planner , I see the simplicity built in. Each page is designed simply for all ages, with no complicated charts or forms. The way the planner is broken down into small, simple parts makes it thorough enough for my 13 year old, yet simple enough for my 9 year old. I’ve been researching student planners for my 12-year old son and this one looks amazing! It is really good. It’s simple, yet thorough. Let me know if you get it and how it works for you. We’ve used home made planners before, but now that my 3Gs are 12 and 13, this is such a great solution for nailing the time management skill second step. It’s a long stairway to using the time God gives us wisely, and I want my kids to continue at a better pace than I have followed. Stewardship is a process. I really need to make better plans this year with my 4. I get so scattered as the year moves on. I have trouble managing my 2. I would lose 4! I’m looking forward to both kids keeping a planner next year and taking a little more responsibility for their time. I’m hoping that will help my personal time management! I have been considering having my son start using his own planner, and this one looks great! I really love all the custom pages that really make this planner stand out. It also looks really easy for a beginner to use. I was really surprised with how simple this planner is, without being childish. I never thought of using a planner for my 9 year old until I saw this one. I am always trying to improve plans and make things better for myself and help my children in being more independent in their work. I like that this planner includes goal setting. This just may be the planner I’ve been looking for all these years! I have just started looking at planners for my daughter. I love the different areas talked about here. This planner seems to be just what I was looking for.